Orthodontics is a specialised area of dentistry that involves the treatment of dental and facial irregularities. It is the science of assessing, diagnosing and treating crooked teeth, jaw discrepancies, facial profile and form. Orthodontists are dentists who have undertaken many years additional training in this specialist area. Are your teeth noticeably crooked? Do you have protruding teeth? Do you have a deep overbite (front teeth overlapping too much vertically) or an open bite (where some teeth cannot be brought into contact)? Do you have difficulty chewing food? Finally, if you are reluctant to smile, laugh or even talk in public without hiding your teeth, it is time to consider orthodontic correction. The correction of an orthodontic problem can be undertaken at any age. Adult orthodontic treatment is growing rapidly. It is generally recommended that children should be brought in for their first evaluation at ages 7 to 9 years. The main aim of orthodontic treatment is to create straight teeth that look great! This will help you feel good about your appearance, thus improving your confidence and self esteem. Just as important as looking great is a healthy environment in which your teeth, with good care, can last a lifetime. Metal Braces: Metal braces are the most common type. They are made of high grade stainless steel. 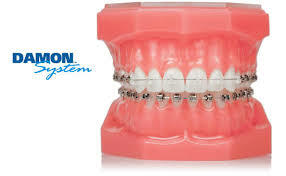 Todays metal braces are smaller, more comfortable, and more attractive. Ceramic Braces: Ceramic braces are made of translucent (clear) material. They are most popular with adult patients, due to their cosmetic appeal. ‘Invisalign’ braces: Invisalign is driven by advanced 3-D computer technology producing a series of customized plastic ‘Aligners’ that gradually reposition the teeth. Lingual braces: Lingual braces are like conventional braces but attached on the inside of the teeth.